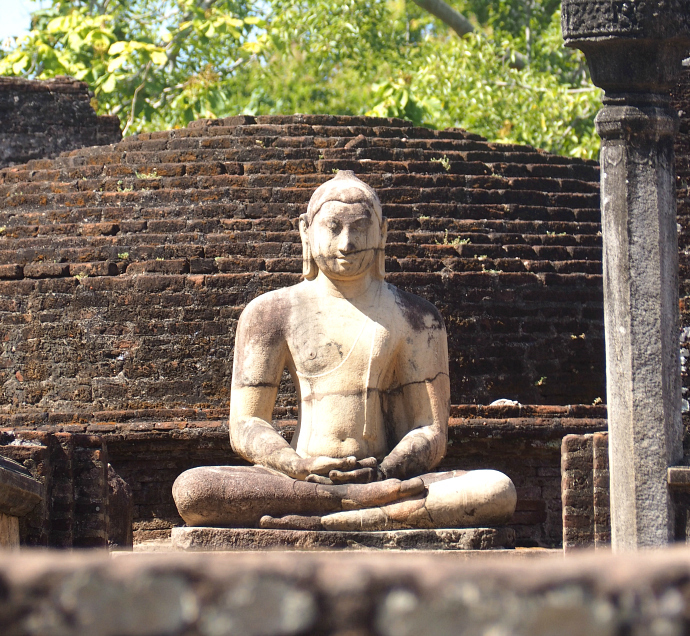 Polonnaruwa was our second stop on our three week adventure around Sri Lanka. 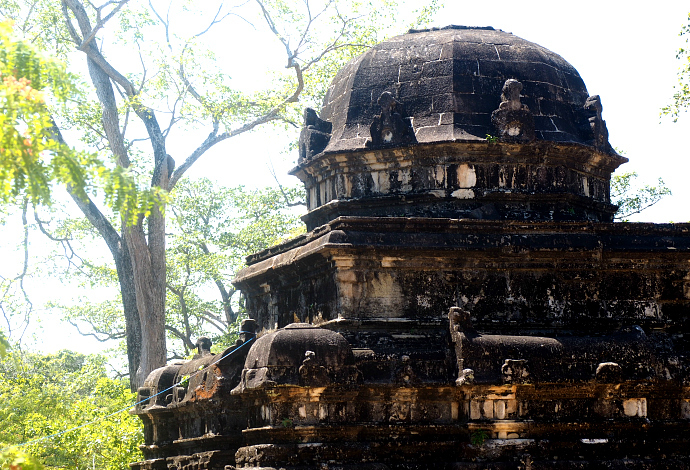 The town is home to the ruins of the ancient city of Polonnaruwa which are apparently the second capital of Sri Lanka. It is now a UNESCO world heritage site. 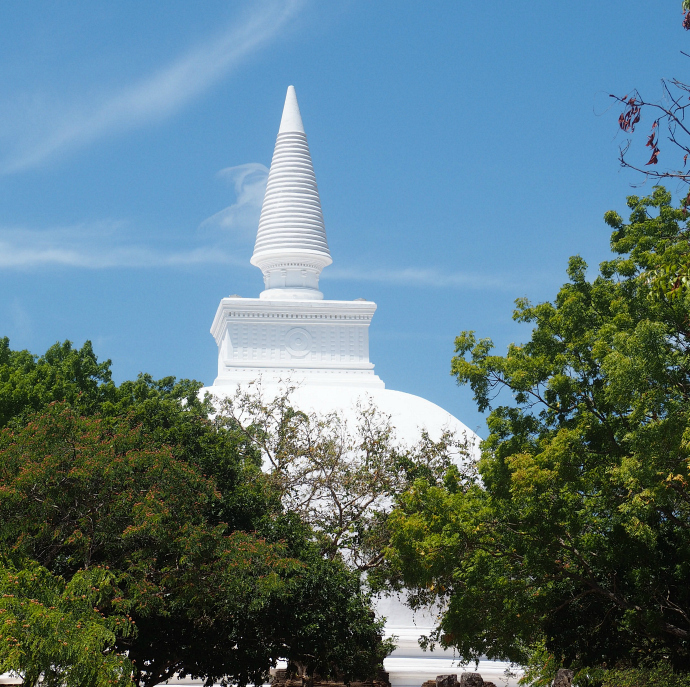 There is also the ancient city of Anuradhapura but we could only visit one on our trip and decided to go to Polonnaruwa. 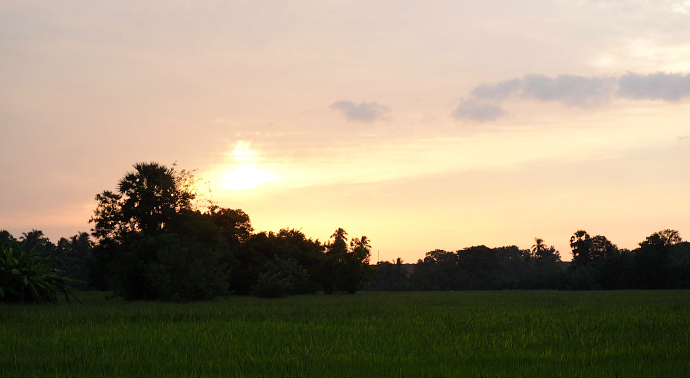 After spending a day in Colombo we got a train up north to the ancient city. Our train left Colombo at around 7 pm and arrived at around 2.15 in the morning. It took longer than expected which caused problems about accommodation. We had booked accommodation for that night imagining we'd arrive at 1pm at the latest. We did tell the guest house owner that we would be arriving late but things didn't quite work out. We got a tuk tuk from the station to our guest house. Thankfully, there were tuk tuks outside the station. They were charging quite an expensive price but it was 2 in the morning. He quoted us 550 rupees which we accepted because we wanted our beds. We got to our guest house and the place had a massive gate that was locked up for the night. Our tuk tuk driver knocked on the gate and called over it. He even tried to jump over to get the owner to let us in. We then got him to phone the guest house. We saw him put the number in so we're pretty sure he called the guesthouse rather than pretending to. We were there for a good 15 minutes. Our tuk tuk driver then told us that his brother owned a guesthouse so we could stay there for the night. At this point we were thankful as we were stranded. Turned out his brothers guesthouse was right next door! That's why I say I'm not sure whether he phoned our original guest house. We thought he might just be trying to get us to stay at his. But he did shout and knock so he was either very good at pretending to help or actually was. So we ended up next door being shown a room. We opted for no air con as it was a lot more pricy. That's something we found in Sri Lanka; the price of non air con compared to air con was quite a big difference compared to the difference in India. The idea of getting up early and heading to the ruins after getting to bed way after 3 am was not particularly pleasant. Instead, we decided we'd explore other parts of the town and do the ruins early the following day. For ease we ate lunch at our guesthouse. It was while we were eating our lunch that the owner of the guesthouse we'd originally booked poked his head over the fence and started shouting at our host. He wanted us to go round and talk to him. He demanded we pay him money. Because our booking had been made on booking.com he had lost out by us not staying. However, we refused to pay since it was not our fault that we were no longer staying at his. He told us he had been awake and no one had called. However, considering how loud we had knocked this seemed slightly suspicious. 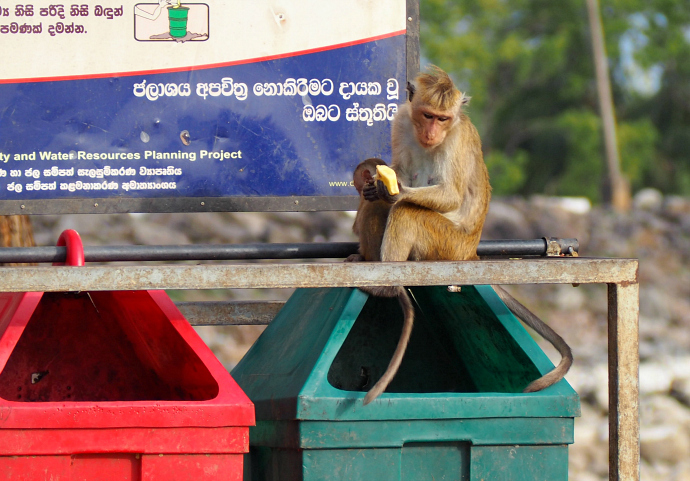 We left his guesthouse and headed back to ours where he continued to poke his head over the fence and yell. Not long after we decided to escape and go for a wander. We began to walk towards the town, heading for the lake. This was around a ten minute walk from our guesthouse. The lake was quite large so we decided we wouldn't walk the whole way. Instead, we walked along one side and then down a small street where the locals came to bath and back round to our guest house. 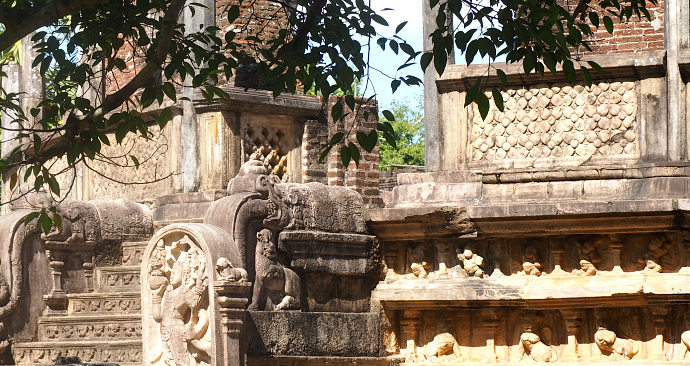 If you're in Polonnaruwa for more than a day then the lake area is worth checking out. I think there's a museum and restaurant but we didn't stop at either. There were plenty of monkeys around the lake and also a lot of dead bats. We saw them hanging on the phone wires and wondered why one earth they were just chilling in the open in the middle of the day. It wasn't until we got back to the hostel and I googled bats that we discovered that all the bats we had seen were in fact dead. They go to hang from the wires and end up getting electrocuted! The poor things! Apparently it happens quite a lot. So that was probably the most morbid discovery of trip. In all honesty the rest of the day was spent chilling and looking in the local supermarket. We went out again for dinner. The guesthouse offered a buffet dinner, however, Kate is vegetarian and there wasn't much on offer for the price. We only wandered the same way we'd gone in the afternoon to the lake and struggled to find food. We eventually found a shop which seemed to double up as a cafe. I had my first egg hopper of the trip, while Kate had her first Kottu. These are both traditional Sri Lankan dishes. I'm afraid I have no pictures but you can give them a google. A hopper is a bit like a pancake but in a bowl shape with the egg cooked within the bowl. Kottu is chopped up roti with vegetables and egg. My descriptions probably don't paint the best picture but both were pretty yummy and cheap. My hopper was around 41p, I wouldn't class it as a proper meal as it's not that filling but for that price you could even get two or three if you were still peckish. 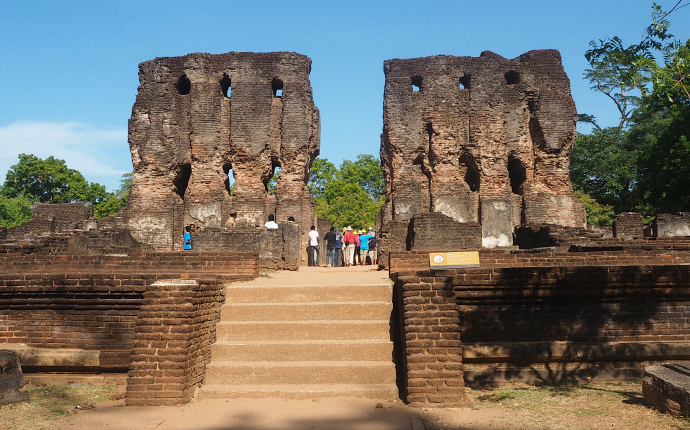 On our second day in Polonnaruwa we hit the ruins. We got up early but not as early as we would have liked and headed to the ruins. We rented bikes from our guest house and rode to the ruins which were around a 15 minute ride away. There are a number of ways to get to and around the ruins. We'd opted for bikes as they seemed to be the cheapest option. Technically, walking would be the cheapest but I would not recommend this and don't think anyone actually walks around the ruins because there is a lot to see and it is quite spaced out in some areas. Some come in tour groups so have a mini bus or coach, others seemed to have a private car and some hired a tuk tuk. I can't tell you how much a private car would be but someone from my guesthouse was quoted 1500 rupees (just under £8) to hire a tuk tuk for three hours which I think would be plenty of time to see the ruins. If you've come to Polonnarawu on a day trip then a tuk tuk would probably be the best way to get around unless you're already part of a tour group as this will save you time and not break the bank. I'm sure you can hire bikes from somewhere even if you're there for a day trip but again I can't advise on where you could rent them from because we were staying there for a couple of nights. One thing I can advise you on, however, is where to buy your ticket. We made the mistake of riding to the entrance and having to go back down the street to buy our tickets. The tickets for the ruins must be bought at the museum and not at the entrance. The tickets are checked here but you cannot purchase them here. We assumed we could and this meant we wasted time. The museum is located further up the street, near the lake. It's best to google map it beforehand. I'm not sure if this was just the case for the entrance we used or if there even are other entrances but it's something you should be aware of if you're planning a visit. Once we purchased our tickets we headed in, the signs lead us first to the bathing pool and royal palace. Because we got to the ruins a little later than planned around 9.30/10 am it was already starting to get busy. There were a couple of tour groups. However, once we headed towards the other ruins it became quieter as the ruins became more spaced out. I would recommend going earlier than we went to avoid the build up of crowds and to avoid the heat! It got hot! I'm not great with heat (and yet I seem to go to lots of hot countries) so the heat definitely affected my experience of the ruins. I spent less time taking in the ruins and more time trying to find shade, I found a tree eventually and shared the shade with a stray dog. There are people selling souvenirs around the ruins. I normally avoid these but they had some really nice buddha statues which were very cheap. However, I didn't end up buying one as we still had three weeks of our trip left and didn't fancy carrying one around especially as it would probably get broken. There are also areas where you can buy drinks and fresh coconuts. My friend Kate ended up having a very strange orange juice. The orange was green but she thought she'd give it a go anyway. Let's just say green orange juice does not taste the same as normal orange juice. In some areas you must show your ticket again for it to be stamped. When entering some of the ruins you must cover up. I wore a midi skirt and vest top but took a scarf with me to cover my shoulders when necessary. This meant that I could stay cool when riding around the ruins but still go into/ walk around those that required covering up. You also have to remove your shoes in certain areas so wearing some that are easy to take on and off is recommended. We spent around three hours at the ruins, I would have stayed longer but the heat got to me. I'd say 3-4 hours is probably the best amount of time but if you had a car or tuk tuk you could probably see it all in two hours if you were short on time. Bus to Dambulla costs 100 rupees (55p!) for the local bus. There is no air con but the windows are open so there is a breeze. This journey takes around 2 hours. 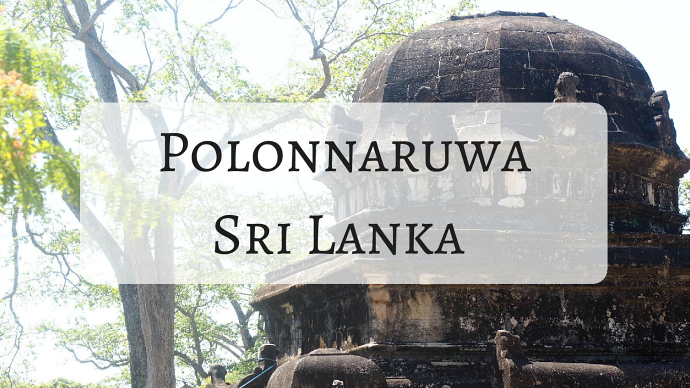 Have you visited Polonnaruwa? What did you think about the ancient ruins?